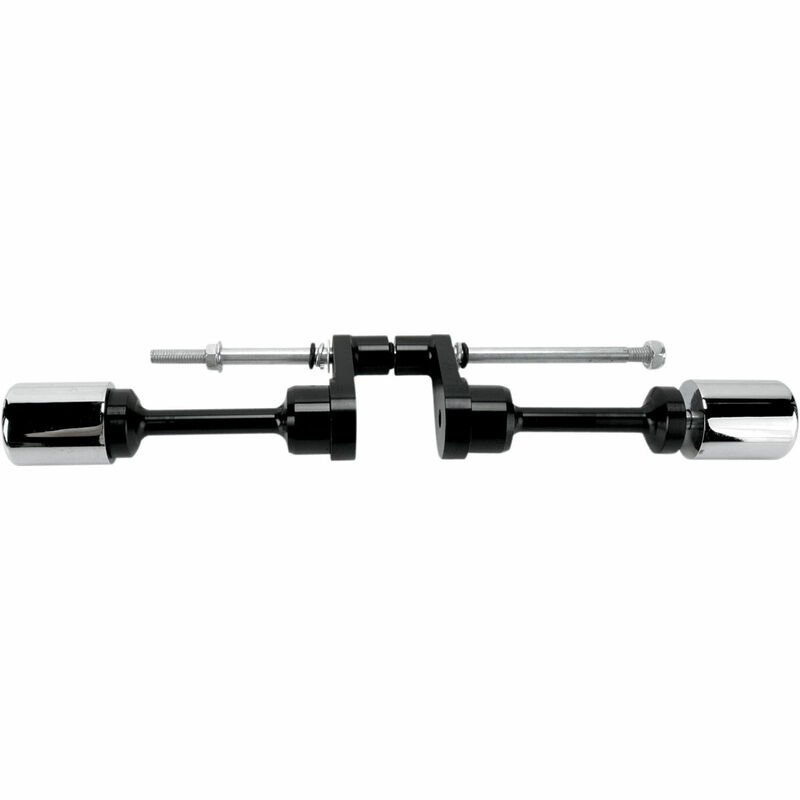 Pro-tek chrome frame sliders are triple chrome plated for that show look. Helps protect your frame from nasty spills and tip overs. Some applications require cutting of fairings. Comes complete with instructions for easy installation. 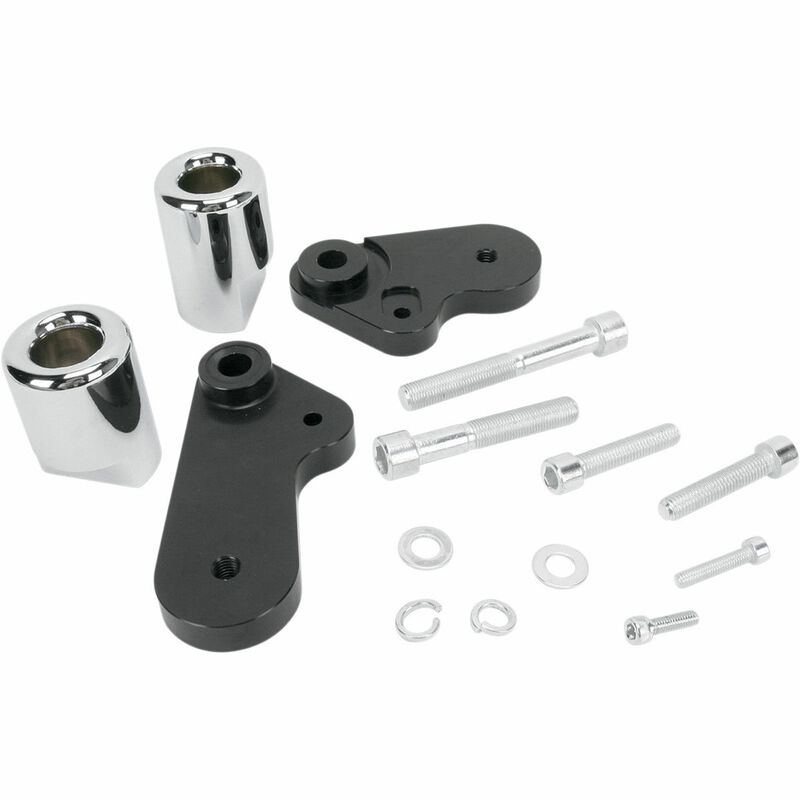 Frame sliders are not designed to protect the plastics, rearsets (footpegs), or clipons (handlebars). They are designed to absorb the impact and energy of a fall so that you don't damage your engine or frame. Those two parts of the bike are critical components for racers and an insurance company as they will often total your bike if those are damaged. 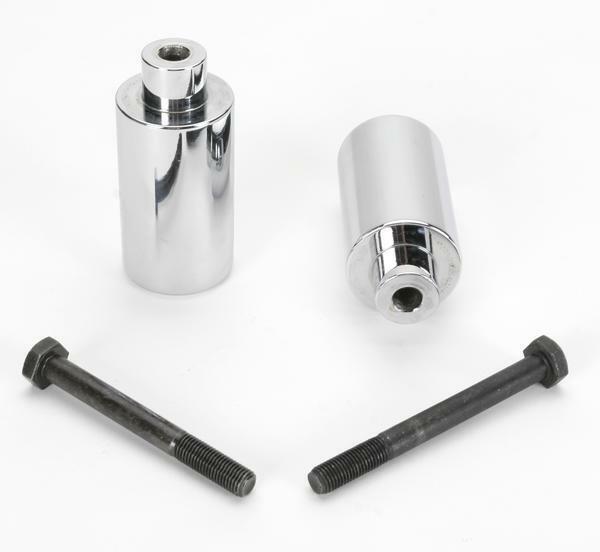 Frame sliders come in two basic models which are cut or no cut frame sliders. 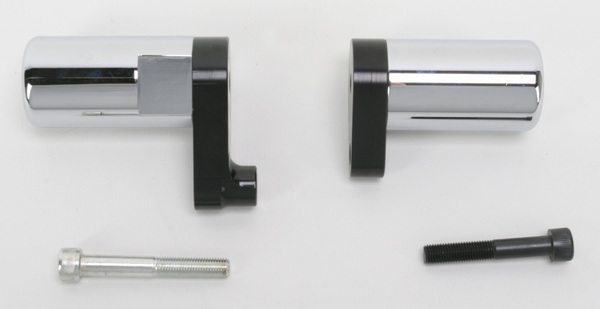 A cut frame slider means that you have to cut your plastics to be able to bolt that type of frame slider on to your bike. No cuts obviously mean you do not have to cut a hole in your plastics.�We like each model�to have to cut a 2" hole in your plastics and�other kits with no modifications you do not have to cut anything. The no cut kit normally has brackets that you mount up below your plastics that then go to a place where there are no plastics then you bolt on the slider to that plate. Basically the plate lets you relocate where the slider will bolt on.�No cut sliders are also more expensive. 1. They are not designed to protect plastics, clipons, or rearsets, even though they might help sometimes. 2. You do not want a slider to stick out too far or it will help flip your bike in a crash by snagging on the ground, curb or anything else. 3. You want delrin or plastic to touch down when you crash as they will grind off and not catch on anything and if hit hard enough or direct enough they will shatter. 4. If your slider shatters, grinds off or bends then it did it's job. You don't want it solid after a crash or it didn't absorb any energy but merely transfered it on to what you bolted it to. 5. When f1 cars hit the side of a track they explode as they don't want the drive to absorb the energy. Frame sliders are the same way. You want them to stay attached but get beat up and take the energy. 6. If the bolt on a frame slider bends that's a good thing as the only other option is to put the energy on the frame or mounting point. �Better the bolt bends. Also if it didn't bend it might have flip the bike by snagging something. A mangled frame slider, but still on the bike, did it's job. 7. 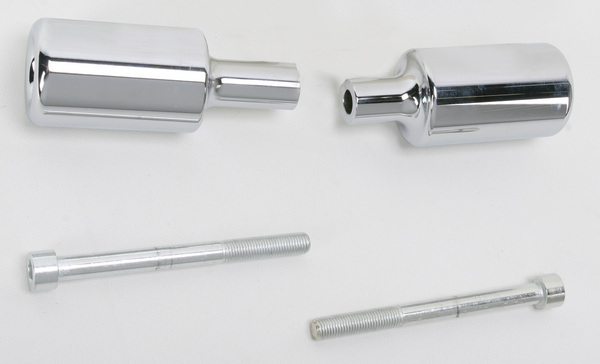 No cut frame sliders aren't a direct bolt on like cut sliders as they often have a bracket. We hope this information was helpful and if you have anything to add or questions then feel free to contact us. Ride safe and hope you never have to use your frame sliders. Click Here to view Chrome Sliders Application Chart. Click Here�to view�Frame Slider End�Caps Application Chart.